It’s fascinating that the entire 2012 Industry has become an Religion in itself, or no different to Religions that occupy the Minds of Humanity, because – just as with Religions, there are different Prophecies existent with regards to 2012, and so Humanity is again grouped into different categories of beliefs/faiths/praises regarding which Prophet of prediction/prophecy suit their Minds/experiences. And so, as with Religions: many are waiting, and waiting, and waiting for either doom or salvation. However, the 2012 Religion has evolved the ‘old Religions’, from the perspective that – it’s no more “waiting for your doom / salvation” in heaven/hell/ascended dimensions: it’s now All going to happen RIGHT HERE in/as this physical existence. So, here is then also the connection of Spiritualities/Religion regarding ‘death’ / a death, from the perspective of ending up in heaven/hell/ascended dimensions or wherever it is one will be ‘going’ with the advent of all the different 2012 Prophecies. So, what is then within this, being more ‘realistically’ challenged within human beings’ Minds/Consciousness – is ‘Death’ / ‘what happens after death’. Some Prophecies give human beings a control over/of a death, such as within the realms of Spirituality, through ascensions/shifts, and then with Religions through following specific rules/laws/regulations of belief/faith/praise that will secure you a controlled position into and as Salvation; and obviously within this is existent the polarity of the bad/negative/evil/dark side of it all, that if one Do Not/Have Not followed in faith/belief the rules/laws/regulations of what will secure you a position/place in the Promise of a ‘better Afterlife’ / ‘shifting/ascending from this physical existence’: there will be Consequence, accordingly. So, instead of how it’s always been before – “waiting for one’s Death” to reach the afterlife/heaven/attaining ascension etc. it’s like “time has been compressed” and it’ll all happen right here, right now according to the days/times that’s been set by most Prophecies. So, the question within this all is – Why would we so fervently change our lives for the prospect of ‘Death’ / ‘a Death’, especially when it Promise anything better than what we face in our Minds and in our Daily Lives as what ‘life on Earth’ in/as this Physical Existence has become? Because, this is what 2012 and the Prophecies within it essentially accentuate/emphasize, an End, a Death, which is within this – a very well dressed-up, deliberate Suicide, essentially – this process of how many human beings are preparing to leave, to end, to die, to go; to no more exist in the Minds, their lives, in/as what ‘life on earth’ has become. But it’s not viewed as a form of Suicide, because – it’s being induced by something/someone/unknown forces ‘unseen/invisible/Mighty/Powerful’ and one is ‘going to go to a better place’ than what is existent here within/as this Physical Existence. But, the starting point within this entire 2012 Religion, is in fact a leaving, an end, a death – people think/believe that their attention is existent within ‘going to some place better/more/advanced/evolved’, but what is chasing that want, need and desire is the prospect of leaving behind what ‘life on earth’ / ‘life in the mind’ is/has become. Now, some questions exist within this all, which are the following: Can any human being, at this stage say, that they’ve in any way, physically, practically, contributed/dedicated their lives to do EVERYTHING possible with the resources available to them, to assist and support mankind, this physical existence, the animal kingdom? And, I mean, this is not just about praying, meditating, going to church, heightening vibrations/energy states of consciousness – I mean, actual, real physical-practical participation – really getting out there in the World to change the lives of Humanity? So, it’s interesting within this, then – that, what would such “requirements”, of only having to pray/read books/go to institutions/heighten vibrations/frequencies/meditating (which, by the way seem to only, predominantly, benefit the MONEY system than actual ‘life on earth’) say / reveal about the gods/beings/forces that have apparently placed such requirements of reaching a salvation/attainment, but there’s never anything practical, regarding Living In/as this World, taking Responsibility for what is Here, changing what is Here – all such practises do, is seclude/separate/lock the human being into and as the Mind/Consciousness, Internalizing themselves completely, separating themselves from the Physical/this Physical Existence – existing entirely in “two worlds”, the consequence of our living in this real, physical existence, and then living to/towards the prospect/promise of/as a “better hereafter/afterlife/ascension”. So, many human beings are creating this absolute Hype regarding 2012, the end, a death – driven, motivated both by/through Fear and Excitement, and even those that do not ‘believe’, do Wonder – for moments, “what if” / “what would happen” / “who would I be” etc. So, here again – existent the Polarity, the Fear of Death, the Fear of our Minds, the Fear within our Lives, and then the Excitement to/towards the end / a death in the Future – the REALITY, being the Fear that we’re existent within, that relates to ‘what life on earth has become’ and the excitement the ILLUSION, as it relates to an alternate reality “somewhere out there”. 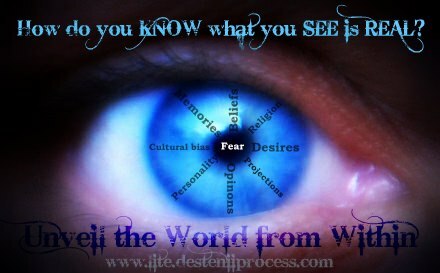 So, all this 2012 Process is doing, is furthering human beings’ friction/conflict relationship between the Physical REALity and the CONsciousness/mInd Illusion, because human beings aren’t seeing, realising and understanding the extent to which all of this is in fact only happening in their mInds, seeing through the “I” of Consciousness, instead of with the Physical EYES, the REAL EYES with regards to what we’re accepting and allowing in our lives, humanity and this physical existence as a whole as our direct Responsibility to/as what ‘life on earth’ as become. And, even with us having TWO EYES (for most human beings) to SEE through, and even if one cannot physically see – one do SEE within self through the Eyes, the Physical Eyes of others when one hear about what’s going on in this world and the deterioration/extinction within and as it: that human beings will not use the REAL EYES, but will use the mInd’s “I” as Consciousness, and the Personalities within us that’s determined this “I” of/as Consciousness as the “who I am”; this One “I” that will only see One Point, through One Point, One Dimension as ENERGY and entirely miss the Multi-Dimensions of/as this Real, Physical Existence if/as human beings would only See and Hear through and as the Real Physical, in and as Equality and Oneness Here. And so, in and as this One Point, One Dimension of/as Energy as Consciousness as the mInd as the “I” in separation from/of the equality and oneness with/as this Physical Existence: human beings’ awareness is easily Distracted into and as “tunnel vision” to see nothing else but through ENERGY/Consciousness, and completely miss what is in fact really going on in/as this Physical Existence – which such 2012 Prophecies illustrate. Because, not one being has even considered: Asking the Physical, everything that is here in/as this Physical Existence – what’s going to become of Humanity, what the future holds for this existence. That, human beings are so separate from their own Physicals, into and as Consciousness/Energy – that human beings haven’t even realised, that the Physical is Aware, can communicate, can express, can show, can teach – as is being walked through the Portal, in Interviews, especially – all available on EQAFE. Where, for example, at the moment – the Animal Kingdom are coming through, and communicating/showing/giving perspectives of the current existence of humanity, and our relationship to the Physical Existence, and the multi-dimensions of equality and oneness in/as the Physical that is/has been missed, ‘cause human beings are missing in/as their awareness, in/as their relationship to the Physical, this Physical Existence as a whole. So, if any “doomsday” / “end times” are coming, it’s going to be directly and indirectly created/manifested by/through the Minds, the Consciousness of/as the human race, which is what we’re already, single-handedly doing, because while the majority of human beings’ attention is being diverted to/towards 2012 – the World System continue as is, its consequential relationship to humanity, this physical existence continue as is, the Elite remain in their positions of authority/control as is…and human beings would still, even though nothing will happen, justify, validate / excuse the reason/purpose for the Prophecies not materializing…EVERYTHING else, BUT taking Responsibility for/as what is HERE in and as this real, physical existence. So, this is another point that 2012 has in common with religions, spiritualities, movements – not taking Responsibility for self, self’s life/living, self’s relationship/position to humanity/this world system, to how we’re accepting and allowing ‘life on earth’ to continue existing as is, with no Change – but existing in/as the distraction, the preoccupation of what human beings can Imagine in/as the Quantum Reality of ENERGY as Consciousness, in/as separation from/of the Physical/this Physical Existence as a whole. So, we’ve got Many more Dimensions to walk through, which we will continue in the Next Posts to come – here are but a few to consider, and we’ll furthermore explore/walk the dimensions of, for example – how/why human beings ‘live for Death’ so, but would not ‘Live/Change for LIFE, here on Earth in/as this Physical Existence’? Why/how are our Minds to preoccupied with Death and the Fear thereof, already from early on within our lives – instead of aligning ourselves/our lives to LIVE / change this world into/as an existence of LIFE? Why/how is it, that the World System/Consumerism System primarily makes its profit through exploiting the Fears of Death of human beings, why is the World System/Consumerism System not geared to ensuring LIFE/LIVING for all of humanity, equally as one? And then finally, what is sound, energy and physical symbolism existent within/as the word ProMise and its alignment to/as Prophecies/Predictions for/as the Future? …more to come in the next posts.